Often overlooked in favour of nearby Railay, Ao Nang is worthy of a place on any Thailand itinerary. Despite not being one of the country’s more famous spots, it’s the perfect base from which to take day trips around the Krabi area. For such a small town, there’s plenty to do – whether it’s visit Railay beach, island hop or hike for incredible views of the area. Ao Nang town itself is well established with everything a traveller could need – from luxury resorts to budget accommodation. 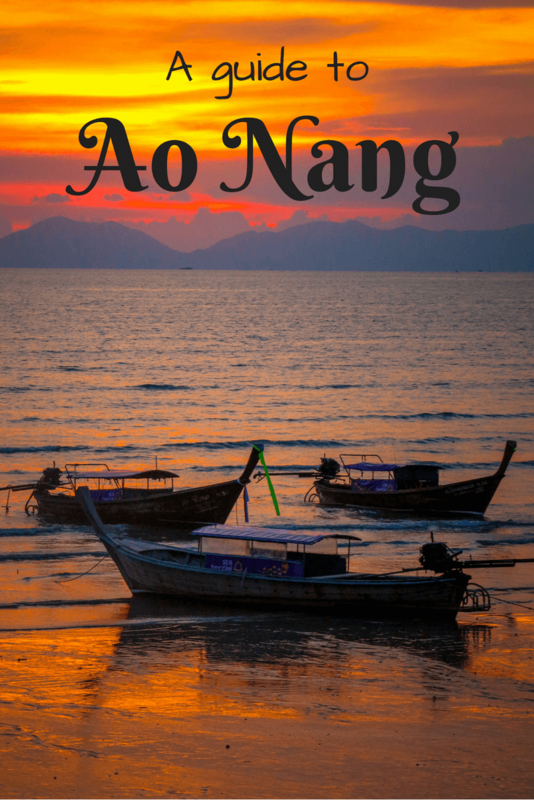 Everything you need to know before visiting is in this Ao Nang travel guide. Fly – The nearest airport to Ao Nang is Krabi International (KBV), which most domestic airports have flights to. Click here to find the best flight prices with Momondo. Depending on your budget, there are a number of ways to reach Ao Nang beach from Krabi airport. The cheapest option is to take a Songethaw to Krabi Town and then change to another Songethaw to Ao Nang. This should cost 100 baht (50 baht for each ride) in total, and will take around 2 hours. If you’d prefer to go directly, shared vans at the airport are available for 150 baht. The most expensive option is to take a taxi for 600 baht – which is only really worthwhile if you’re travelling in a group. Bus – To reach Ao Nang by bus you’ll have to make your way to Krabi – which is doable from any part of Thailand. From there you can follow the above instructions to take a Songethaw or ask your bus driver if they run a connecting service to Ao Nang. Boat/Ferry – As there are many islands nearby, you can also reach Ao Nang by boat. Boats run from Koh Phi Phi, Koh Lanta and more to Krabi pier, which is around half an hour from Krabi Town. Transport is a bit limited, but we managed to get to Krabi Town for 100 baht and then get a Songethaw to Ao Nang from there. Tuk tuks – For just 30 baht per person, a tuk tuk should take you anywhere within Ao Nang. There is a minimum 60 baht charge so if you’re travelling solo it will work out as slightly more expensive. You’ll find plenty of tuk tuks available along the main street, so waiting shouldn’t be an issue. Motorbike/Scooter – Rentals start at 200 baht per day. You should have an international drivers license to be able to legally drive, but in reality this rule isn’t enforced. Some companies require you to leave your passport with them as a form of insurance – although some backpackers have been forced to pay extra to get them back so be wary. Bikes are a great way to get around and give you access to a much wider area for far better value than tuk tuks. It goes without saying that you should always wear a helmet. On foot – As Ao Nang is a relatively small town you can easily walk pretty much anywhere you need to go. That being said, if you fancy getting around slightly quicker, tuk tuks are a great cheap alternative. For the best weather, visit between December and March. During this time it tends to be dryer weather so it’s less likely that rain will ruin your time on Ao Nang beach. Monsoon season runs from May-October – meaning more rain and cooler temperatures. During this time it’s possible to have 2 weeks of almost consistently heavy rain. In contrast, it’s also possible to have 2 weeks straight of dry weather if you want to take a chance. The rest of the year falls between low and high season, so in general you shouldn’t have as much rain as during the monsoon season. 4-island tour – Our favourite thing to do in Ao Nang was island hop. The easiest way to do this is as part of a 4 islands tour – visiting Koh Poda, Koh Gai, Koh Tup and Koh Mor. The downside of doing it this way is that the islands can get very crowded as most tours follow the same schedule. If you’re looking to have a more peaceful day, we suggest finding a group to rent a private boat. This actually works out cheaper than the tour if there are enough of you. Hiring a private boat for half a day to visit Koh Poda and Koh Tup costs 1700 baht. There’s also a fee of 400 baht for visiting the islands, but this is a one off fee that covers all islands. You can also rent a private longtail boat for 2000 baht to visit all 4 islands – which is great value if you fit the maximum 8 people into the boat! For a return ticket just to Koh Poda you’ll pay 300 baht, but have to wait for at least 6 people making the same trip before the boat departs. This can take a long time as many people prioritise a visit to Railay. We chose to visit both Koh Poda and Koh Tup by renting a private boat with another couple. Out of the two, Koh Poda is far more impressive – with an imposing rock formation found just off the shore of the white sand beach. In contrast, Koh Tup was a bit of a let down. We’d seen pictures of the sandbank online, but it quickly became apparent these photos are highly edited to encourage tourists to visit. That being said, both islands were relatively quiet so we were able to enjoy them without the masses of tourists found on the 4-island tour and at Railay. 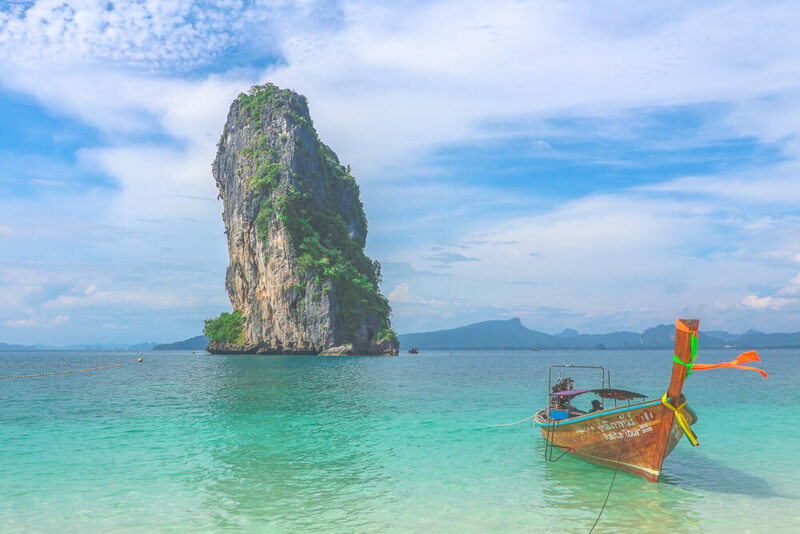 Railay – One of the most popular things to do in Ao Nang is visit nearby Railay – an area on the mainland only accessible by boat. The beaches of Railay West and Phra Nang are the main attractions found in Railay. Both beaches have gained popularity due to the white sand and picturesque setting amongst limestone cliffs. If you fancy getting a different perspective of the scenery it’s possible to rent a kayak for around 200 baht an hour or hike to a viewpoint overlooking the area. Unfortunately though, both beaches are extremely popular amongst tourists and so if you want to enjoy them peacefully you’ll need to arrive early. We ended up leaving Railay by 11am as the masses had swarmed to the beaches and we prefer more secluded spots. Boats run from Ao Nang beach to Railay beach from 8am to 6pm with the journey taking 10-15 minutes and costing 200 baht return. It is possible to get a boat after 6pm but it costs more. Boats only depart when full, with the operators insisting on waiting for at least 8 people before departing. 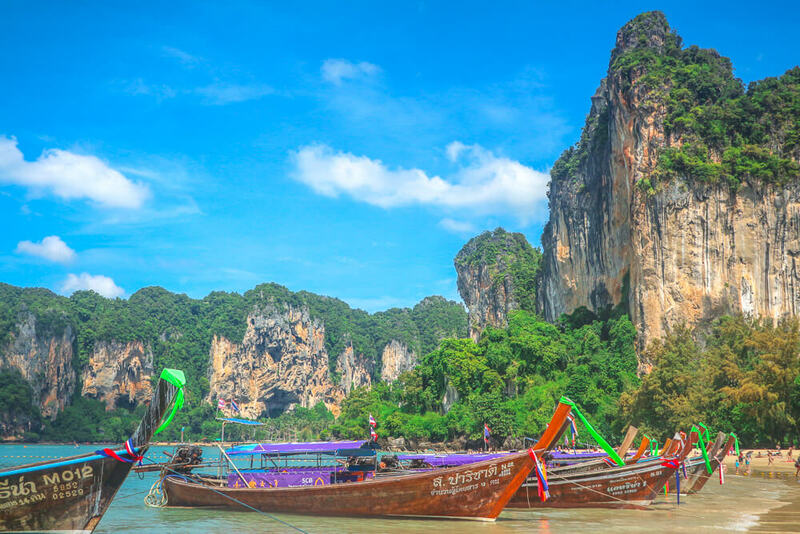 As boats only depart when full, we recommend buying a one-way ticket when you visit Railay. That way for your return journey you can select the operator with people waiting and leave quicker, as opposed to waiting for the boat to fill. As our boat was taking so long to fill we ended up paying more to leave sooner. Ao Nang beach – Whilst not as impressive as other beaches in the area, Ao Nang’s beach is an easier option. If you just want to enjoy the sun and have a quick dip then it’s the perfect option to avoid spending more on a longtail boat ride elsewhere. Ao Nang beach is also a great place to watch sunset, so we recommend heading down to check that out! Tab Kak Hang Nak Nature trail – If you’re looking for an alternative to the array of beaches on offer, head for the Tab Kak Hang Nak Nature trail. It takes around 2 hours to climb to the summit, and offers wonderful views of the surrounding area. The trail is a fair way outside of Ao Nang so you’ll either need to rent a scooter/bike or take a tuk tuk/taxi there. The set fare for a tuk tuk/taxi is 1500 for the day, which should include the driver waiting for you and taking you back to Ao Nang. Take plenty of water with you and start early to avoid the mid day heat. We always prefer to get a bit off the beaten track, and this is one of the best ways to do so in Ao Nang. Being somewhat of a tourist hotspot, Ao Nang has a number of resorts, hotels and hostels to suit all budgets. If you’re looking to treat yourself, look no further than the amazing Aonang Cliff Beach Resort. It’s the perfect spot to enjoy a relaxing few days, with luxurious rooms and a spa on site if you fancy being pampered. 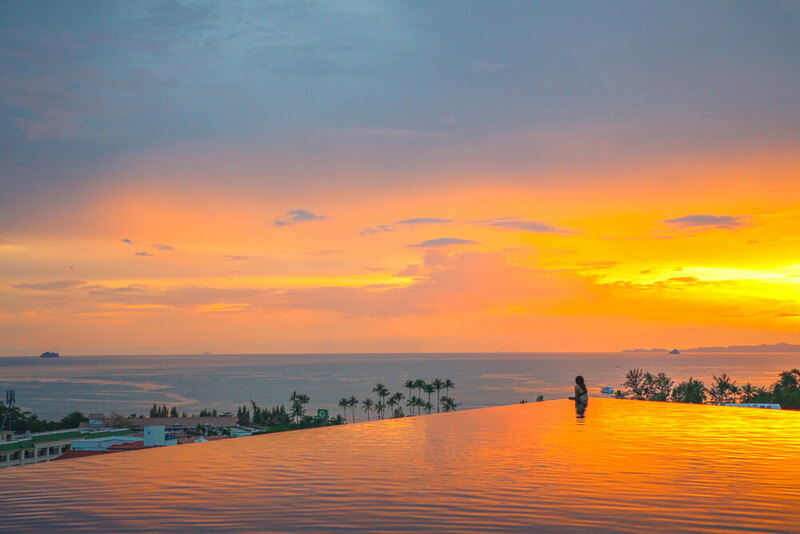 Without a doubt though, it’s the infinity pool that makes this resort so special. Not only does it provide the perfect place to watch sunset, but it also offers spectacular views out to sea and of towering limestone cliffs. The only downside is that eventually you’ll have to leave. It’s definitely one of the best hotels, if not the best, in Ao Nang Beach, Thailand. If you’re looking for something different, here are some of the best properties in Ao Nang for different budgets. Located a 15-minute walk away from Ao Nang beach, Aonang Goodwill Hotel is a great budget option. Private rooms with air con are available from around $16 USD (550 baht) per night. Click here to see Agoda’s latest deals at Aonang Goodwill Hotel! The Ava Sea Resort is a great option if you’re looking for a hotel with a pool in Ao Nang. It’s conveniently located just a short walk from Ao Nang beach, and there are plenty of restaurants nearby too! Rooms start at $100 USD (3,700 baht) per night. Click here to see if the Ava Sea Resort is the right place for you! Another brilliant option if you’re looking for luxury is Panan Krabi Resort. The rooms are spacious and comfortable and there are 2 swimming pools to enjoy! Rooms start at $153 USD (5,100 baht) per night, with breakfast included in the price. Click here to take a look at the Panan Krabi Resort! Aonang Buffet Restaurant – The higher end option in Ao Nang is the Aonang buffet restaurant. For 499 baht per person you can indulge in a large variety of Thai and western dishes – perfect if you’ve worked up an appetite after a day at the beach! Andamana Beach Club – Escape the crowds of Ao Nang with a trip to the Andamana Beach Club. Complete with its own private beach, it’s a great spot to grab a reasonably priced lunch. There’s even hammocks on the beach – ideal for a post-lunch drink or two. Located outside of Ao Nang itself, there’s a free shuttle for guests of Aonang Cliff Beach Resort. If you’re staying elsewhere you’ll need to make your own way there, but it’s well worth it if you fancy a few hours away from the busy streets of Ao Nang. Lobster Restaurant – If you’re looking for Thai food on a budget, this is the perfect place. Despite the name, we didn’t try the seafood and instead opted for the Thai green chicken curry – a steal at 60 baht. There are a number of other budget options on the special Thai menu at the front of the restaurant. For some reason, it’s hard to find much about this place online but click here to find out the exact location. Amp & Aing – For those staying a little further away from the beach, Amp & Aing offers excellent Thai food at affordable prices. With meals for as little as 60 baht, you really can’t go wrong with this budget option! Trying to decide where to go next? 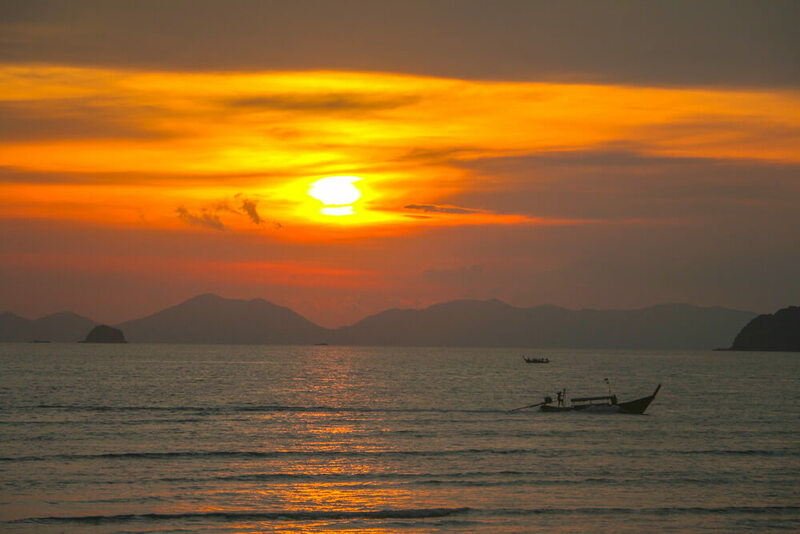 Check our our guide to Koh Lanta – an island paradise just a few hours away from Ao Nang! 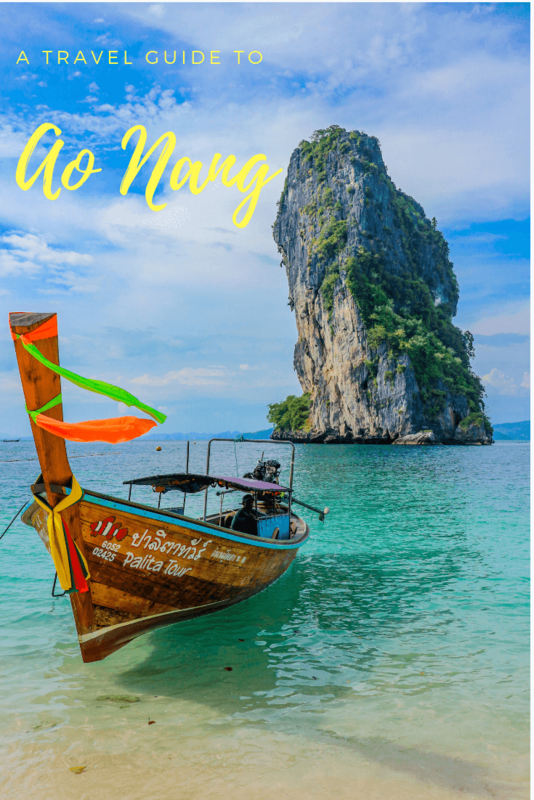 Like this Ao Nang travel guide? Pin it!